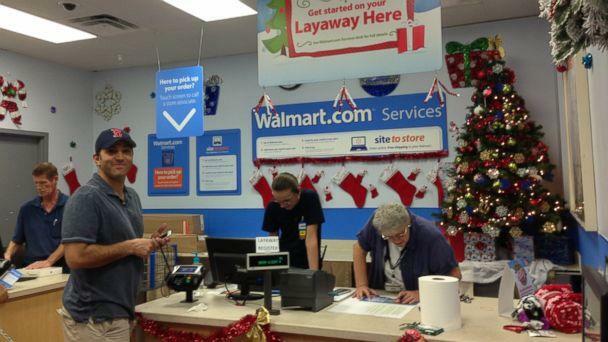 More than 75 people will have a merrier Christmas this year, thanks to a man who used more than $21,000 of his own money to pay down their layaway account balances at a Walmart in central Florida. Greg Parady went into to the Walmart in The Villages, Fla., on Dec. 7 to purchase some bicycles that he was going to donate at his company's charity gala. But while he waited for his wife, Jenni, and business partner, Cindy Nazzaro, to arrive, he overheard a woman telling someone that she didn't think she would be able to afford to collect the items on her layaway account. Parady, who was browsing and texting, said her comments didn't register with him immediately, but as he browsed the bicycle section, the financial planner found himself next to the layaway department and started thinking about how he could help. On a whim, he asked a layaway associate for the total cost of all the items on layaway. The answer was $89,000. He wanted to donate about $20,000, and brainstormed with the store associates for the best way to put his money to use to help those who needed it the most. An associate suggested that he could pay half of any layaway bill that was more than $200, figuring that those might represent the customers who had children or those who had been paying down their accounts the longest, he said. "So I said alright," he told ABCNews.com on Monday night. "I started this process and after the second one my credit card gets declined because my bank probably wants to know why I'm buying multiple things at Walmart for the first time since last year. … So then I pulled out another credit card and that one went for another couple of transactions." Parady, who runs Parady Financial Group, a retirement and financial planning company in The Villages, called and asked his company's controller to let the banks know what he was trying to do. After more than two hours, Parady had paid down half of 76 layaway accounts. He also paid the accounts of people who happened to come to the layaway section in person while he was there. One young lady who had come in to make a payment got an early Christmas present from Parady. "Her tab came up … and I said 'Let me take care of that' to the guy that was ringing her up, so he brought it over and she just started crying," Parady recalled. "And then I started crying and then the ladies behind the desk started crying and then my partner Cindy started crying. So I said, you know, 'Merry Christmas.'" He said it took between 30 minutes and 40 minutes for the woman to collect her items because she was so overwhelmed and couldn't stop crying. "She just kept mouthing the words 'thank you.' It was really overwhelming and really made me feel good that I was in a position to do it, you know?" he said. Walmart operations assistant manager Deb Davis told ClickOrlando.com that she'd never seen anything like it in her 13 years at the company. "I can't believe [his credit cards] didn't melt he was running them so fast," Davis told ClickOrlando.com. Nazzaro, the managing partner at Parady, said the entire incident was surreal. "It was a couple of hours of just pure joy," she said. One elderly woman who came in on a motorized wheelchair had her TV paid off by Parady. "She just kept asking me all these questions. She asked me if I was Ashton Kutcher … and I said 'take that back,'" Parady said, chuckling at the memory. "She goes 'do you play for the Red Sox?' because I had a Red Sox hat on." Helping out at Walmart was different from giving a check to a charity organization because he was able to see the effect up close, he said. "I know it affected people immediately. I mean they were getting text messages that payments were being made on their accounts while we were there and people were calling saying 'I think there's a mistake,'" Parady said. "It was so special. It was really special." He then bought the bicycles and went to the gala. Parady wasn't seeking attention for playing Santa, Nazzaro said. In fact, he didn't want anyone to know who he was, but a few days later a store manager asked permission to share the story with Walmart's corporate relations department, she said. Deisha Barnett, a Walmart spokeswoman, said she never heard of another case where someone had paid so much on other people's layaway accounts in the three years the service has been available. She said Walmart appreciated the generosity, adding that there had been 1,000 other "layaway angels" at work this holiday shopping season. Parady, whose son, Bennett, is 8 months old, said having a young child made him think about the holidays in a new way, and he hopes people will pay it forward. "My mom was a single mom for a long time and I was a layaway kid so it's nice to be able to help," he said.